My plan, for quilt camp, was to get a quilt top together. I packed light this year – a mere three projects. My big one was my 2012 block of the month. Each month, it would roll in, it’s little packet tempting me… c’mon, it would say, you know you want to… but there was always housework or children or other projects that demanded my attention. 2013 came and I started with big plans and collapsed in a heap around the 6th of January when morning sickness set in. The I had a newborn and three other children and then another one starting school and and and…. all the while, my BOM sat waiting, hidden in a drawer so I didn’t need to think about how badly I’d failed. With my recent clean-out, I ditched and finished a lot of WIPs, and this is one that haunted me. I really wanted to see the finished quilt, and I didn’t want it to linger for another three years. Into the camp bag it went, and I did spend a good chunk of the weekend sewing. More than once, I mentioned how unproductive I felt compared to last year’s Aviatrix marathon, but as the girls reminded me, this year I was a lot more relaxed, and actually enjoying myself, which is true. It had a very different feel to last year. When I got to the point of wanting to scream if I saw another flying geese, I sat it aside, and worked on some crochet. I sat back with a coffee and chatted. I played with my journaling bible and Car’s fabulous art supplies. It was nice. It was fun. I missed my target of having the top together. What I do have, however, is 12 completely finished blocks, and a game plan to get it together. 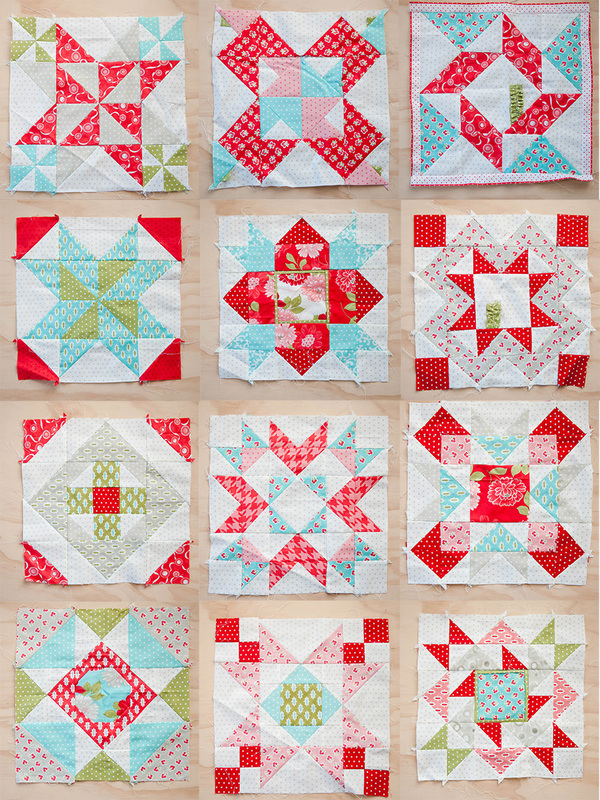 I added a little twist to each block – as I mentioned last week, I’m not a fan of ending up with the exact same blocks and quilt as everyone else. for two blocks (the top two in the right hand column), I added a ruffle. Another two (centre of row two, and bottom right) I added a flange to the centre block. The block in the centre of the top row I added prairie points to the outside. The remaining blocks the change was often flipping the orientation of flying geese, or half square triangles. It seemed like we’d decided on a layout option over our final morning tea, and I even started adding frames (see top right), but on the way home, I dreamt up another option, which I believe is the one I will go for, that will see me end up with a 60″ square quilt. For now, it sits in my craft tote, still packed from camp. I dare not unpack, for fear it will remain lingering in the drawers for another three years. Ideally, I would be working on it this week while the weather is cool and wet, before it gets too hot for quilting, but it’s not to be – I am busy printing stock and prepping for my very first Barefoot Letterpress market stall, which is both terrifying and exciting. I’m madly making cards and stationery and books, and slowly slowly seeing the light at the end of the tunnel. Next week I will reward my hard work with some quilt top assembly, but today, I print. Haha!! This one loses out at being my oldest WIP by a mere 6 months!! It’s definitely the second oldest WIP. Only just finished the final block too, So I have a pile of blocks also in a space bag back in Cairns awaiting me! 6 measly little months? Damn! I need to try harder! Thank you! I finished the quilt top yesterday and adore it. And camp is BRILLIANT for those kind of things, this year I packed super light so I would Get Stuff Done!